In the final two home matches of the season, the No. 5 Virginia men’s tennis team celebrated the careers of its seniors—Alex Domijan, Justin Shane and Ian Uriguen—while clinching its 11th consecutive ACC regular season title and breaking an all-sport ACC record. After tying the record Friday upon defeating No. 32 North Carolina State, the Cavaliers extended the program’s conference win streak to 117 matches Sunday in a 7-0 rout of No. 23 Wake Forest. Friday, the Cavaliers (19-2, 10-0 ACC) took on the Wolfpack (14-8, 3-6 ACC). 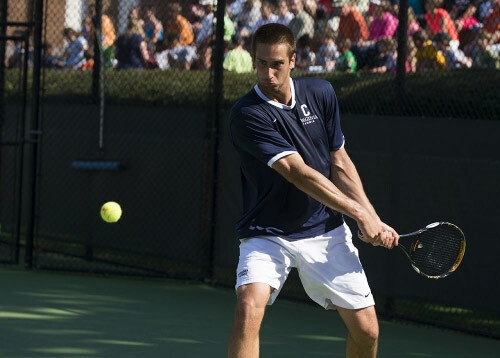 Because the match was part of the USTA College Match Day series, the teams played singles before doubles. NC State managed to put up a tough fight early. The sole exception was No. 63 sophomore Mac Styslinger, who was able to pull away to an early 4-1 lead in his first set and go onto win the match 6-1, 6-2 to give the Cavaliers a 1-0 lead.